Dominical Costa Rica is a friendly surf town on the Central Pacific Coastline, 28 miles south of Quepos. 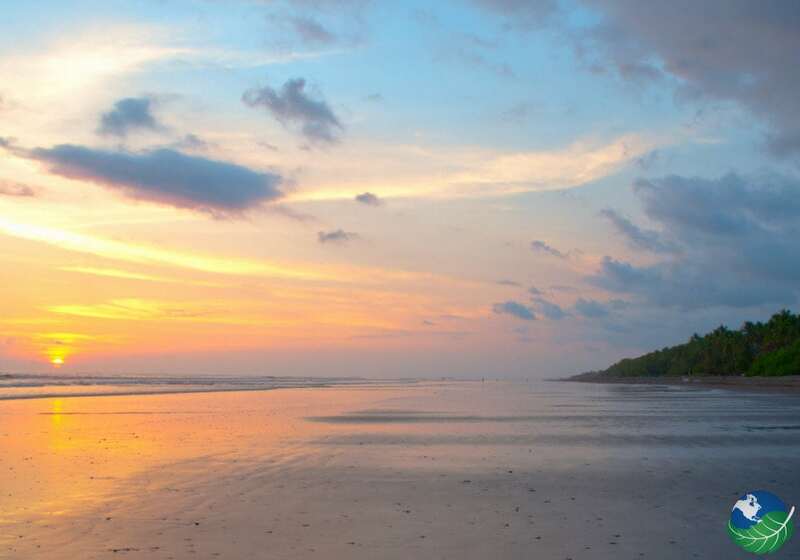 This 4km long beach is rated as one of the best beaches to surf at in Costa Rica and Central America.Central America. Dominical is a quiet little fishing village that has slowly transformed itself over the years into a surfing, expat community. You’ll find about 700 residents, hotels, restaurants and resorts, several different surfing schools and waves for beginner-advanced surfers. Dominical isn’t only for surfers, either. Come to Dominical to explore the lush rainforests surrounding the small village, go scuba diving off the coast, horseback riding to the Nauyaca Waterfalls and take a day trip to Caño Island. 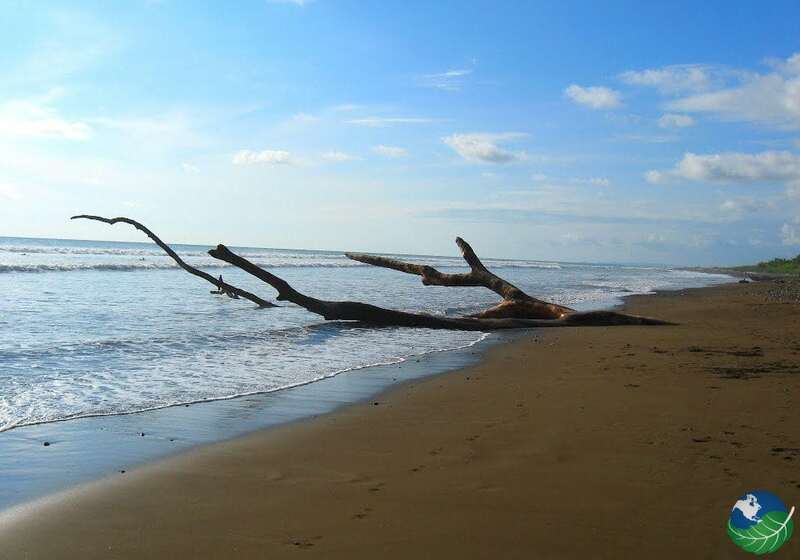 Make visiting Dominical a priority on your next Costa Rica vacation! Some of the best waves of Central America are found at Dominical Beach. Surfers have reported 10-foot waves. The waves are best for experienced surfers. However if you would like to advance your skills, there are plenty of surfing schools for beginner surfers to advanced surfers operating in Dominical. It is pretty common for surfers to camp on the beach in order to get the most out of their time on Dominical Beach. If you like to surf, Dominical Costa Rica is for you. The Corcovado National Park offers great tours, and you can see some of the oldest primary wet forests in Central America. In fact, 5% of the world’s animal population live in this small national park, making it a famous ecotourism destination. Look out for Tapirs, Harpy Eagles and squirrel monkeys in the their natural habitat. Don’t miss hiking and camping in Corcovado National Park! The Manuel Antonio National Park consists of both a tropical rainforest and a marine life reserve. You can use one of the easy trekking trails or take advantage of one of the rafting tours. It is only 30 kilometers from Dominical and you’ll get a chance to see white faced capuchin monkeys, sloths, howler monkeys, tropical birds and hundreds of insect species before you relax on the two beaches. It’s also a great place for zip lining! 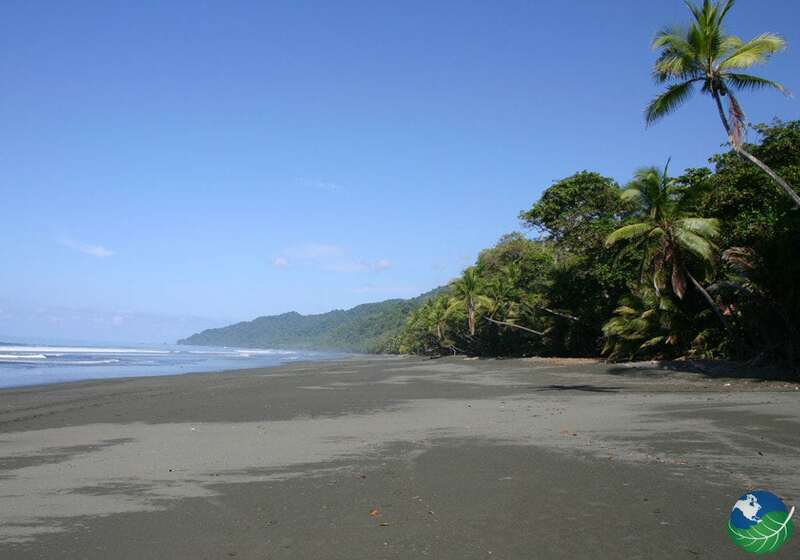 Uvita borders the Marina Ballena National Park on the Southern Pacific coast of Costa Rica. It’s the best place in Costa Rica to go whale and dolphin watching. From December-March and July-October the whale watching is incredible. You’ll see humpback whales and Brydes whales. You might also spot several shark species, dolphins, Olive Ridley, Leatherback and Green Turtles. Uvita is also home to the world-famous Envision Festival. It’s a four-day music, yoga and dance festival you don’t want to miss. If you want a romantic getaway, try horseback riding to Nauyaca Falls! After a relaxing 12-kilometer ride through the rainforest, you can enjoy a traditional Costa Rican casado before taking a dip in the natural pools. Nauyaca Falls works hard to preserve the beautiful rainforest; it’s a great place for ecotourism. If you are not a surfer (or even if you are) and you still want to jump the water, visit Caño Island for some of Costa Rica’s best scuba diving. The Island is off the coast of the Osa Peninsula and is a biological reserve. This island is one of the most exciting dive spots in the world where you can see incredible underwater marine life. Watch for manta rays, whale sharks, sea turtles and dolphins! You can also visit an archaeological site (a Pre-Columbian cemetery) or go to El Mirador for a fantastic lookout spot. It’s a good place to see lush vegetation and wildlife, as the trails on the island are well marked. Dominical is famous for having great weather most of the year. The official dry season is from December-April, but you’ll still have a great time from May-October. The rainiest months are from October-November. There are a lot of dangerous currents on Dominical Beach, so avoid swimming there. The beach is more suited for surfing and scuba diving. The sun in Dominical Costa Rica is strong! Don’t let a sunburn bring your vacation down. Pack plenty of sunscreen and always stay hydrated. The great thing about Dominical is that there is so much to do in the area. Visit nearby national parks like Manual Antonio and Corcovado. Spend a day snorkeling off of Caño Island or exploring the Nauyaca Falls. 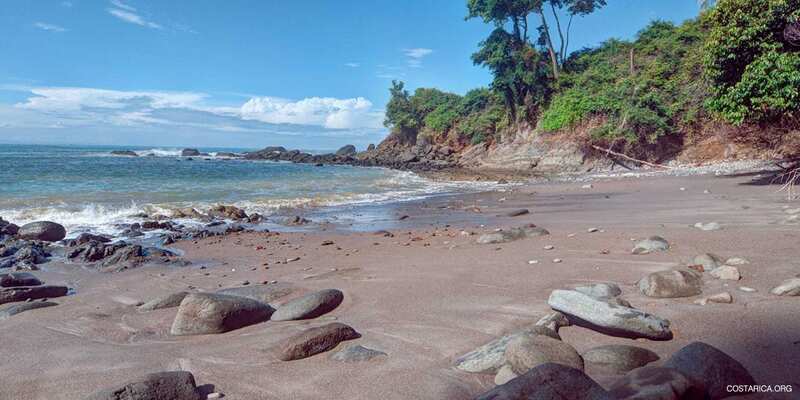 Dominical is located in the southern part of Puntarenas. There are two routes you can take when getting to Dominical. You drive through the Talamanca Mountain range by driving south from the Capital City, San Jose on the Isidro de General highway. Or take the scenic coastal highway from Quepos. Both options are beautiful. You can get there with a private transfer, shared shuttle or rental car. My Costa Rica can help you decide which option is best for you, especially if you are bringing along your own surf board. If you choose to rent a car, make sure to read about driving in Costa Rica! After going on a zip line tour in Manual Antonio or hiking in the Talamanca mountains, you’re sure to be hungry! 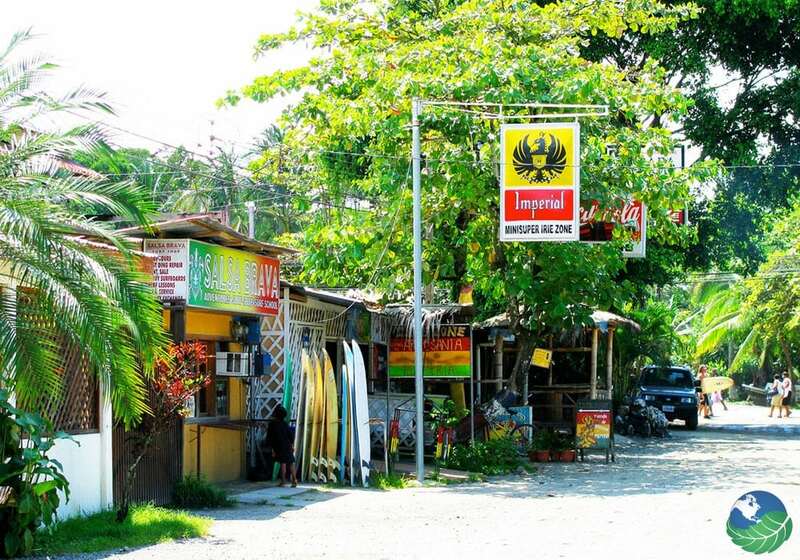 Not to worry, Dominical is not only a great place to surf, but also a great place to eat! For fresh seafood and Central American dishes, try El Pescado Loco. If you’re looking for a healthy, Costa Rican/Central American fusion, eat at Cafe Mono Congo. Find vegetarian and vegan friendly Asian and Thai options, give Phat Noodle a try. The list of great places goes on and on! You can find Italian, Mexican, Latin American, Spanish and even great bar food! Just don’t forget to try a traditional casado while you’re there! The little expat town has all necessary amenities and facilities that you’ll need for a successful vacation. You’ll find hotels, lodges, resorts, restaurants and shops. Indeed some of the first surfers who discovered Dominical loved it so much that they decided to stay and started running businesses. The Hotel Cuna del Angel is a lovely boutique/hotel that is German owned, and the Hotel Villa del Rio Mar, by the river Baru, are two examples of fine lodging in the jungle. You might also enjoy the lush rainforest surrounding the Hacienda Baru Lodge. Very close to nature yet surrounded by style, elegance, and comfort!